Stretching along the downtown Columbus Riverfront from the Arena District to the Whittier Peninsula, the Scioto Mile is the city’s premier downtown destination. 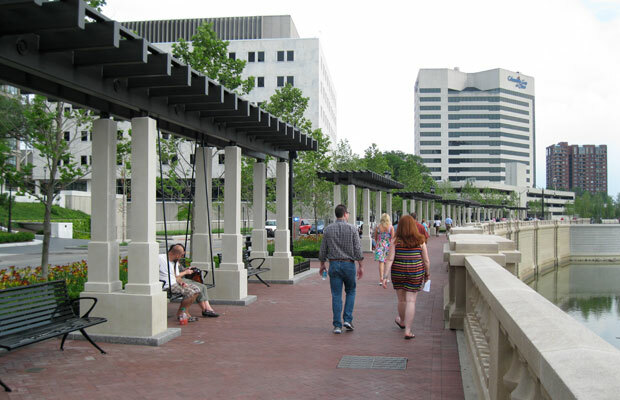 Often referred to as an “urban oasis,” Scioto Mile Park is comprised of more than 175 acres of scenic overlooks, lush parkland, fountains, and a riverfront promenade. Offering some the city’s most popular features, be sure to check out the 15,000 square-foot interactive fountain, do some cross training at the country’s largest free outdoor climbing wall, and take a moment to enjoy the tranquil beauty of the 120-acre Scioto Audubon, known as a “magnet for shore birds and birds of prey.” The Scioto Mile runs from Bicentennial Park to Northbank Park, and includes views of the Statehouse, City Hall, the Ohio Supreme Court, Le Veque Tower, and Nationwide Arena. This is part of the more extensive Scioto Greenway Trail, which heads about 10 miles from Frank Rd. in the southeast to Fifth Ave. in the northwest. It also intersects with the Olentangy Trail downtown. After study a couple of of the weblog posts in your website now, and I really like your means of blogging. I bookmarked it to my bookmark website record and will be checking again soon. Pls check out my site as properly and let me know what you think. Have you ever considered about adding a little bit more than just your articles? I mean, what you say is fundamental and all. However imagine if you added some great visuals or video clips to give your posts more, “pop”! Your content is excellent but with images and video clips, this website could certainly be one of the best in its field. Great blog! Magnificent items from you, man. I’ve take into account your stuff previous to and you’re just extremely fantastic. I really like what you have obtained here, certainly like what you’re saying and the best way during which you are saying it. You are making it enjoyable and you continue to care for to stay it smart. I can’t wait to learn far more from you. This is really a terrific web site. About 1 Mile RT LOOP.